I went with the famed 2008 GSI Dualist Cookset to begin with. 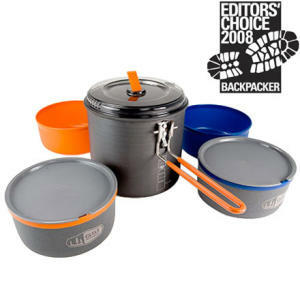 This is a 9 piece cook set which includes: A 1.8L Halulite (Hard-Anodized Aluminum) Cookpot with a rubber coated locking handle, a see-through lid which doubles as a strainer, 2 bowls, 2 cups with insulating sleeves, 2 snap closed sip-it lids and a welded stuff sack that doubles as a sink. All of this nest conveniently inside the cook pot and still leaves room for a stove and canister inside! I bought this set for using when my wife or my son, or both, are along with me for a hike (which is just about every single time). The cups can actually be used as bowls if needed so it is like having set up for 4 people. My Optimus Crux folding stove, an 8 oz fuel canister, my windscreen and a regular Bic lighter easily fits inside the cook pot so it makes it very convenient having my whole kitchen in one spot. I have used the cook pot for everything from boiling water to boiling red beans and rice. I have made good ole Mac-N-Cheese with tuna and cheesy rice with chicken amongst other things. I have managed to burn some of the red beans and rice and while the pot was easy enough to clean up, I can still slightly see where the rice was that burnt. Also, every since then the pot has had a faint red beans and rice smell to it. I have really come to like the cook pot and the way everything compacts inside it. However, over time I have stopped carrying the bowls and the lids to the cups, and just carrying the cups themselves with the insulating sleeves. Not long after this I quit carrying the bowls or cups all together and have just started Freezer Bag Cooking (FBC), so all that I use now is the pot itself and the stuff sack. I don’t mind carrying the stuff sack, but if I am trying to go light, I will leave it as it serves no real purpose due to the FBC. (The pot and lid weighs 8.9 oz, and the stuff sack weighs 1.3 oz). I just purchased a GSI Minimalist cook pot with a WBS Solo (hope the solo is the right size stove for the cook pot). I am looking for something that I can take out with my wife when we go out for an overnight to a weekend. Would you suggest the Dualist from GSI? Also, I am guessing that a cannister stove would work best if we plan on cooking in it at all. I usually freezer bag it when I am by myself. Just wonder your thoughts and what you and Mrs. Stick do. You still use this set? or do both of you just mountain house meals (or similar products)?